Tool for exploring the heavens. Is there a better alternative to Voyager? Is Voyager really the best app in Science category? Will Voyager work good on macOS 10.13.4? Voyager... Educators and astronomers have recognized Voyager as a powerful learning tool, and it has been adopted by many leading universities world-wide for instruction in astronomy. From mountain top observatories to backyard telescopes, it has become an indispensable tool for exploring the heavens. No other program offers the range of features, the ease of use, and the performance of Voyager 4.5. It is an astronomical adventure which will provide years of wonder and discovery. Fixed problems with connecting to Orion and SkyWatcher telescope controllers. 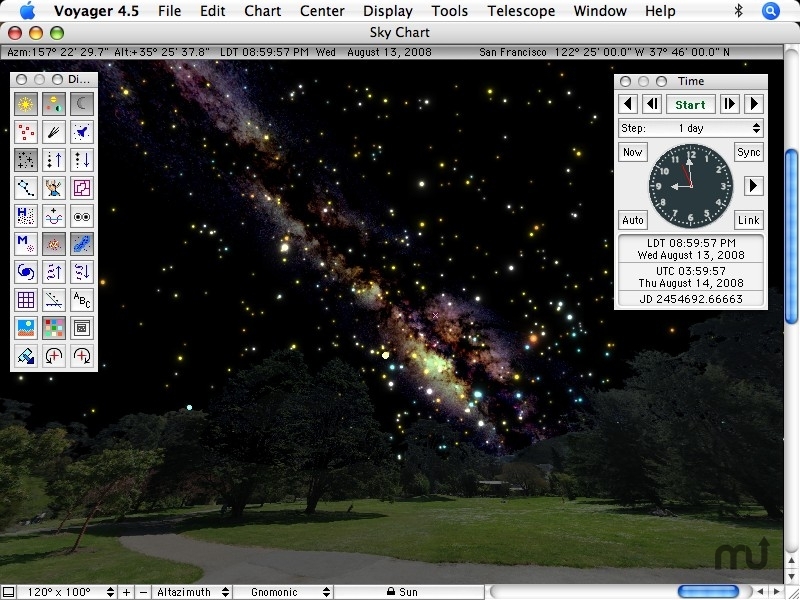 Fixed problem connecting to Takahashi telescope controllers with USB-to-serial adapters on Mac OS X. Fixed disabled GoTo, Align, and directional motion buttons for SkyTracker controllers in the Telescope Control panel. Restored code which displays the current position angle and separation of visual binary stars in the "Physical" tab of the Info Panel. The compass and altimeter displayed in the lower right corner of sky chart windows now update correctly if the chart is dragged while scroll bars are hidden. A crash that occurred while displaying planet trails has been fixed. If the "Correct for Atmospheric Refraction" option is turned on in the "Precision" dialog box, the refracted horizon line now appears at the same location as the standard horizon line. Descriptions for all Constellations, all Messier objects, and a few others, have been updated; Messier 40 and Caldwell 100 have been added to the database. A few common names for deep sky objects have been added and/or corrected; duplicate entries for NGC 7582 have been removed. The Mac version is now built with Xcode 3.2.2. Dropped support for Mac OS X 10.3.9; the required minimum Mac OS X version is now 10.4. The Windows installer is now built with InstallShield Express 2009.